"Jerry is awesome. Simply put. We sold our home in Venice August 2013 after finding Jerry through a friend. We are so glad we did because not only is he a very talented agent, he's one of the most personable, down to earth, and easy going guys we've meant...let alone in the real estate world. And still to this day, nine months later, I can call him for advice and he's just as wonderful as he always is. Our first impression when we had him over to interview...Jerry was so calm, respectful, and passionate about our potential sell of the house. He walked around and instantly saw the points we needed to focus on. Whether it was minor tweaks to pop curb appeal, quick decorating choices, or even thoughts about ways to stage and prep the house for public walk-thrus, we followed nearly all his advice and am so glad we did. And, for the tips we didn't follow, no big deal. Jerry understood our reasoning and rolled with it. So that's my point. I've worked with many agents who seem amazing and all that, but usually it's a facade. We never felt that way with Jerry and he fit perfectly into our family, which by the way meant he had to also deal with our crazy crying toddler and infant, and barky bark dog. Poor guy.A few more high points. We needed a bit more landscaping in our front yard. Jerry had a guy come overnight and do the plantings. Bam! Instant curb appeal. We needed a few more accents inside our house and BAM, Jerry rolls in one night around 10pm (called first, of course) with large sacks full of couch pillows, decorations, coffee table books, etc. And best of all, on the first day of our open house, the neighbor blows up a bounce house and starts bumping the bass for some family get together they also had planned. We literally thought the day was over...and then it started to rain. We were confident it was a disaster now. I remember calling Jerry the morning of in such a panic and full of despair and what did he say? "It's fine, we'll roll with it. Your house is beautiful and people we see right past the party and weather. I'll be there in full force. Just relax and enjoy your day." We did. Within just a few days, we had 7 offers, with 6 AT or ABOVE asking. We were in escrow a few days later. Jerry was great and anyone looking for an agent who knows Venice and it's surrounds, give this guy a call. And if he just isn't the right fit, no big deal. He'll still be excited he met you. Good luck!" "Jerry helped us sell our first home in Mar Vista. We were originally planning on using the most well known agent in the area, but when we met Jerry we were completely impressed by his knowledge of the market, and his very communicative approach to our situation. He analyzed our house and recommended a thorough list of options for us to improve the presentation of our house. Then he guided us through the upgrades and helped us make cost effective improvements before we put it on the market. His marketing was awesome: over 100 people signed in at our open house, we had 7 offers in 2 days and were under contract in a week. At a price higher than we had imagined! I always recommend Jerry to any friends buying or selling homes. Currently Jerry is representing us as we shop for income property in Los Angeles. His knowledge and counsel have been invaluable, and we trust him to guide us to a solid investment. " "Jerry is an amazing realtor. He is really knowledgeable about neighborhoods and takes care to make the right fit for you. Jerry sold me my first house, which was a foreclosure, and helped me successfully close on the house in record time. Years later, when it was time to sell it, he sold it within the first two weeks. Jerry made sure i knew what to do to maximize the house's presence in the current market. I had three offers by the evening of the first open house! Recently, Jerry helped me find and purchase my new home, which I love! It was a complicated probate sale, and without him, it just wouldn't have happened. I highly recommend Jerry Jaffe. He is knowledgeable, insightful, and hard-working. Having him on your side is the best asset you can have when buying or selling. " "Jerry Jaffe handled the purchase our dream house! Jerry identified the house, helped us through a competitive bidding process, then helped us negotiate down the price, and did it all with ease. We felt we were in the surest of hands. In this extremely competitive market, the seller selected our bid over others in part because of Jerry's excellent reputation. He receives our highest recommendation "
"Jerry sold our Venice home for us last month, and we just could not be happier with his work. He began working with us in the fall last year, and advised us on every step, but always in an informative and reasonable way. We felt he was a true collaborator, using his own vast experience and expertise, but also listening to our own design and neighborhood knowledge. He was very involved in the design of the improvements and the staging, and we really respected his informed advice. And when we moved into the negotiation phase, he was absolutely stellar. Our friends asked us what was the best decision we made in selling, and we are very clear that it was engaging Jerry! " Experienced Los Angeles real estate consultant Jerry Jaffe brings a tangible passion to every engagement. He's a master at fulfilling his clients' real estate dreams, whether that's finding the perfect new home for buyers or achieving maximum returns for sellers. Driven by both the thrill of the hunt and the art of the deal, he's equally adept at relationship-building and fierce negotiating. Jerry offers a full-service approach that starts and ends with the needs of his clients. With nearly 20 years experience, he’s handled everything from entry-level homes to premier luxury estates with equal attentiveness and success. For sellers, he brings out the best in each home through meticulous staging and marketing, and he's known for his deft skill at matching buyer with neighborhood. 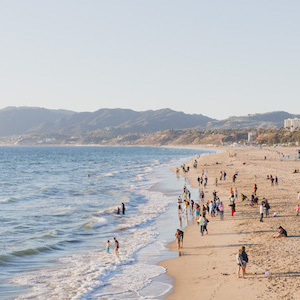 Prior to real estate, Jerry honed his ability to zero in on ideal homes and places in his work as a location scout — a role that also took him all over LA, expanding his unparalleled knowledge of the city’s myriad enclaves.Today he specializes in Santa Monica, Mar Vista, and in Venice, where he resides. Originally from New York, Jerry has resided in Los Angeles for 25 years. He holds a bachelor’s degree in history from Northwestern University.